It was a tough day to determine and scratch out a win, but our top pick hit the board in 8 of 10 races on Friday. We are definitely looking for more on the biggest day of racing for this meet — LA Derby and FG Oaks Day. 1st: 9-6-8/1-11-4/12-3…A MSW event for the LA-breds kicks off today’s action, and I will go with Outlaw X. (9). This one trained by my good friend Buff Bradley ran fifth the first time out. We all know that Buff takes his time and he gets better and better with more experience. Second time out today and the win percentage for the barn goes up to .10%. Show horse in the first race came back to win already. Like the works after the first race, too. Has a shot at some nice odds. Knockalittlelouder (6) is a first time starter for a barn that hits with .24% of those kind. Dam of this one has a winner from 1 starter. Really like the work on March 15. Rider has picked up a few nice wins of late. Malasong (8) was wide in both turns in the career debut and got tired before finishing. Gets the blinkers today, and the barn hits with .16% of those getting the shades for the first time. Nice work on March 17. Nice jock change here. I bet the 9-8 across the board and box the top 3 in the exacta. 2nd: 7/1-4-5/3-6-2…Crescent City Oaks…The first Key Play of the Day comes right here with Midnight Fantasy (7). Comes from he barn of Joe Sharp, who is having a super nice meet — winning at a .21% clip for 217 starters. This one has won three times here already this meet. None of them even close. She is special. She is my pick. I bet the 7 to win/place and then key over (only) the 1-4-5-3-6-2. 3rd: 2-3-9/5-6-7-8/1-4…New Orleans Ladies Stakes…Beau Recall (2) was shipped East earlier this year with the intent that she was headed to the breeding shed. Nobody told her. Since arriving from Santa Anita and the barn of Simon Callaghan, all she has done is win the Blushing KD Stakes and then run a very game second in the Al Stall Memorial Stakes. She picks up Jose Ortiz in the saddle today and she looks very tough to me. My pick. I bet the 2 to win/place and then box the top 3 in one exacta. I key the 2 over (only) the 5-6-7-8 in a smaller version. 4th: 9-11/ 2-5-12/6-10/7-1-3-8…Charge the Line (9) is trained by Tom Amoss for the highly successful owner Maggi Moss. Picks up Irad Ortiz, Jr. today for the mount and that may help. Has hit the board in each of the last 5 starts. Only 1 win, though. In 9 starts here, has a 2-4-2 record. Love the work on March 6. Looks ready to go, but will need some running room late in the going. Where Y’at Joe Joe (11) has hit the board in each of the last 7 races and 9 of the last 10. Consistent. Will be in a stalking position and have the first jump on our top pick. I bet the 9 to win/place/show and box the top 2 numbers in the exacta. 5th: 9-10-8/5-4-7/6-3-14…A MSW event over the 1-mile grass course for the 3YO fillies. I go to the outside — not the prime spot, mind you — for my top 3 selections. Be Nimble (9) ran third here on Feb. 9. Broke from the #8 hole that day. Runner-up in that one has already come back to win. Barn hits with .21% of those making the second career route race. Noble Fever (10) was awful last time out, but that was over the main track when the rains washed it off the turf course. Two back, she was a game third and closing ranks. Gets a new rider up today, and he may be strong enough to push this filly across the line late. Gold Standard (8) cost $1.2 million to purchase, and the daughter of Medaglia d’Oro is training lights out in the a.m. Goes for the red-hot barn of Brad Cox and she simply may be too much for any to handle. But this will not come easy. Out of a dam who was Stakes placed, but has no turf winners from the first two starters. Interesting spot to start. Likely to be over-bet, IMO. I bet the 9 to win/place/show and then box the top 3 in the exacta. 6th: 2/8-3-5-12/6/1-9-4…Crescent City Derby…Shang (2) is my second Key Play of the Day. This 3YO son of Shanghai Bobby has won three in a row after losing by a neck to start the career here on Nov. 17. Won a LA-bred Stakes event at Delta Downs last time out and “surged” at the end of that one to get the win. Game. Gets Jose Ortiz in the saddle today, and that simply can’t hurt. I bet the 2 to win/place and then key the 2 over (only) the 8-3-5-12-6. 7th: 4-8-(16)/9-6-7-14/1-2-7…Our third grass race of the day and I will give the edge to Rock On Kitten (4). This one nearly won here on Feb. 16, running second by less than a length. Held the lead late before getting passed. Jose Ortiz rides this one for the second time, and the education may help. Trainer is having a weak meet here, winning with only .06% of 70 starters. This one may help the cause. Crafty Daddy (8) comes from the Brad Cox barn, and he is zeroing in on another Trainer’s Title. He will have this one ready. Gets the blinkers for the first time today, and the barn hits with .19% of those. Ran third here on Jan. 26. Went 6 wide in the stretch of that one. Florent Geroux returns to the saddle today. Expect more. I bet the 4-8 across the board and then box those two (plus the #16 if he draws in) in the exacta. I will key the 4 over (only) the 8-9-6-7-14 in a smaller version. 8th: 3-8-(13)/10-1-12/11-5-4-6…Copper King (3) is a highly touted son of Medaglia d’Oro, and cost $625,000 to purchase at the Keeneland September Yearling Sale in 2017. Ran second to a real nice colt here on Feb. 2. Had a very rough trip in that one. Gets a new rider in Jose Ortiz today, and he could be all gone at a nice price. My solid pick here. I bet the 3 to win/place/show and then box the 3-8-(13) in one exacta. I will key the 3 over (only) the 8-10-1-12-11 in a smaller version. 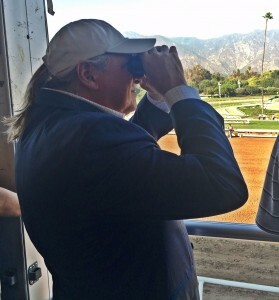 9th: 11-(16)-9-7/13-6-5/10-1…Costa Rising Stakes…A 5.5-furlong turf special for the LA-breds, and I will go to the far outside and land squarely on Afleet Ascent (11). This is another one that gets the services of Jose Ortiz today, and his agent — Jimmy Riccio — has done a masterful job of handling his book since taking it over. But today? Jimmy, my gosh. Lots of chances for Jose on this card. Afleet Ascent comes in off a tough run here on March 2. That was over the main track, though, and going a route of ground. Back to running short on the grass today. Has experience winning against open company in the past and good ones, at that. If he can gear it up today? Watch out. I bet the 11 to win/place/show and then box the 11-(16)-9-7 in one exacta. 10th: 6-2-10/8-11/3-7-5-4…G2 New Orleans Handicap…Silver Dust (6) has been a man all meet long. Won an allowance here in December. Ran second in the Louisiana Stakes in January. Won the G3 Mineshaft Stakes in February, beating the horse that beat him before (Harlan Punch) and beating Flameaway. That’s the same Flameaway that just came back to win a Stakes at Tampa Bay. I’m staying on Silver Dust — a beautiful son of Tapit. He’s hit the board in 6 in a row and is rolling right now. Lone Sailor (2) needed his last race, and should be much tougher today to hold off late. Copper Bullet (10) is a running machine. A beautiful one at that. He gets Jose Ortiz. I bet the 6-10 to win/place/show and then box the 6-2-10. I will key the 6 over/under the 2-10-8-11 in a smaller version. 11th: 7-3/2-1-8/4-5-9…G2 Muniz Memorial Handicap…What a race. Wow. Bricks and Mortar (7) comes into this one having won the Pegasus World Cup Turf Invitational and an allowance at Gulfstream Park. Before that , he was a narrowly beaten third in the G3 Hill Prince and the G3 Saranac. Good right now is an understatement. Chad Brown shipped him here for a reason. Synchrony (3) has raced 4 times over this course in his career. He has never finished behind another horse here. Divisidero (2) ran second to another horse in this race in the G3 Tampa Bay Derby, and he is a classy closer. Hot Springs (1) is my Upset Special at 15-1 ML odds. So what to do? I bet the 7-1 across the board and then box those two in an exacta. I will key the 7-1 over/under the 3-2-8-4 in two lesser versions. 12th: 2/4-6-8/1…G2 Fair Grounds Oaks…This race should belong to Serengeti Empress (2). She is the fastest horse in the race. She is the most talented horse in the race. And, she is the class of this race. But…there’s always a but…If Speedette (1), situated to her inside, goes early and uses her speed, it could compromise the huge favorite in this one. Serengeti wants the lead. She demands the lead. The only two times she has lost has been when she has not made the lead. So, there is some drama that may unfold. Still, all in all, I go to my Key Play of the Day in Serengeti Empress. I bet the 2 to win (only) and key over the 4-6-8-1. 13th: 6/4-3-1-7-8/10…G2 Louisiana Derby…This is another race where the favorite seems to be overwhelming, and, I too, go with War of Will (6) as my last Key Play of the Day. This guy has not been beaten since being moved to the dirt track. In fact, he has not even been challenged. At all. I don’t think he will be challenged much again today, in truth, if he breaks well and finds a nice running spot without much horseplay from the other riders. Sueno (4) looks to me to be the best of the rest. Comes in from California, by way of Oaklawn Park. Beat Long Range Toddy last time out, and that one came back to win a division of the Rebel Stakes last Saturday. Ran second to Gunmetal Gray before that, too. If he is anywhere close to 8-1 odds, like the ML suggests, I jump on that, as well. I look for both Limonite (3) and Roiland (1) to make the serious late runs for the underpinning placements. I bet the 6 to win/place and then key the 6 over (only) the 4-3-1-7-8-10. I will box the 6-4 in a solid exacta, to boot.